Shipment contains SIX of 6V 14 Ah rechargeable SLA batteries with T1T2 type terminals for Lithonia ELR2. Please reuse your cables and connectors - we ship only batteries. 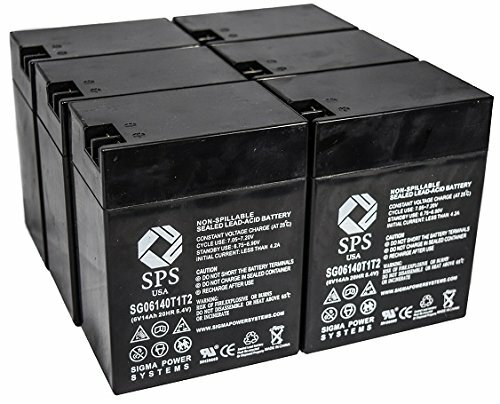 Replacement batteries supplied by RightPrice Batteries for Lithonia ELR2 are of high quality, designed to meet or exceed original OEM specifications. They were manufactured by ISO certified companies. Spec: 6V 14Ah, LxWxH = 4.25 X 2.8 X 5.5 inch, Weight = 4.8 LBS per unit. If you have any questions about this product by SPS, contact us by completing and submitting the form below. If you are looking for a specif part number, please include it with your message.